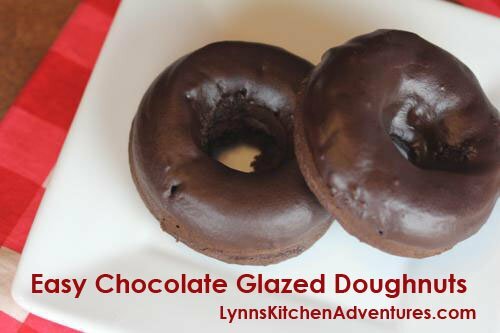 Easy Chocolate Glazed Doughnuts anyone?! My sister gave me a doughnut pan a few months ago for my birthday and I have been having a lot of fun playing around with different recipes and combinations of doughnuts and toppings. And now I am wondering why I did not buy myself a doughnut pan years ago. Seriously, homemade baked doughnuts are so good and so fun to make. 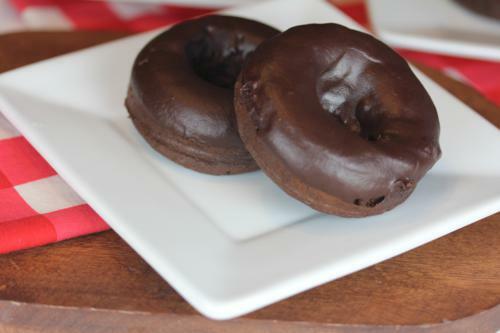 The chocolate glazed doughnuts I am sharing today are very easy because you use the shortcut of a cake mix. Yes, a cake mix, but it makes these really good. Wouldn’t these make a fun weekend treat for your family this weekend! I might just have to make another batch for my family. If you want the gluten free version that I made, be sure to head over to my allergy section. In a bowl combine cake mix, eggs, butter, and milk. Beat until smooth, about 2 minutes. Spread into greased doughnut pans. In a microwave safe bowl combine chocolate chips, butter, and corn syrup and cook until melted. I cook 30 seconds, stir, cook 30 seconds, stir, and repeat until smooth and melted. Add in water to thin out the glaze. Dip cooled doughnuts in glaze. The glaze will harden slightly as it sits. Doughnut recipe adapted from Duncan Hines. Wow. These look fantastic. And so simple with a mix! I don’t think that I have wanted a donut pan, but now I do! This looks great! I have been going through lots of baked donut recipes, and many warn that they are best served right away. What about your recipe? Can I hope to make these the evening before my Easter brunch? They look so good! I thought they tasted fine the next day, so I would think so. You might try a batch before to make sure you are happy with them, but I think they would work. Which doughnut pan do you have? I’ve seen quite a few out there. Also how many can you make in one pan? Six? I have the wilton one that makes six. I love the wilton one, but am guessing the other brands work fine also. I am assuming that I can change these up by changing the cake mix flavor? These sound really yummy! I wanted the donut maker that Aldis carried a couple of weeks ago, but never got there to get one :o( I do have a puff pancake maker from Ginny’s that I am going to try these out in… think donut holes :o) Is it breakfast yet??? LOL! I think you could easily use just about any cake mix you want. Then change it up and use powdered sugar or something else in place of the chocolate glaze. So many different yummy combinations. I don’t yet have a donut pan but when I get one…how full do I fill the circles? Is it like muffins where you need to leave room for them to rise or you have a complete mess (learned the hard way just like mini loaf pans…lol)? They do rise some, so yes, you fill them about 3/4 fill like you would a muffin pan. And if you don’t have a donut pan, but have a mini muffin pan they work too. It is not quite the same since the shape is different, but before I got my donut pan I used a minu muffin pan for baked donuts and it worked fine. I hope that helps. Thanks so much…I bought myself the pan you suggested for my birthday next week. I have the cake mix and chocolate on my next subscribe and save order about a month away though so I’ll have to be patient…lol!